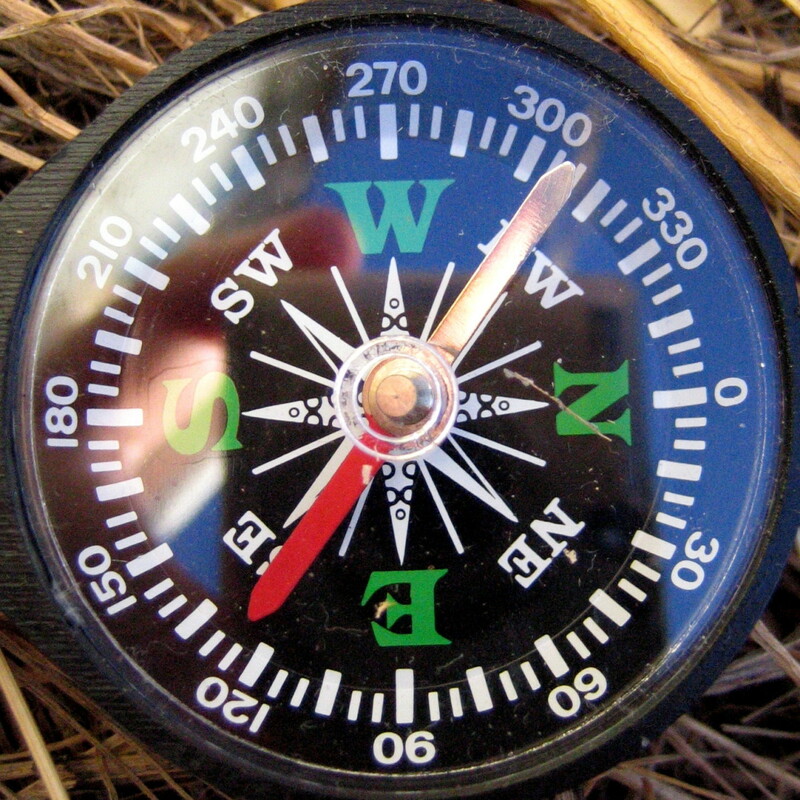 A compass is a wonderful tool for finding your way around compass points that confuse so many people. How to use and read a compass, (if you are traveling any distance off the beaten path without a GPS device), is an essential survival skill. Why? No handy outlets to plug in battery-chargers exist out in nature, so your GPS unit won't be of much use. 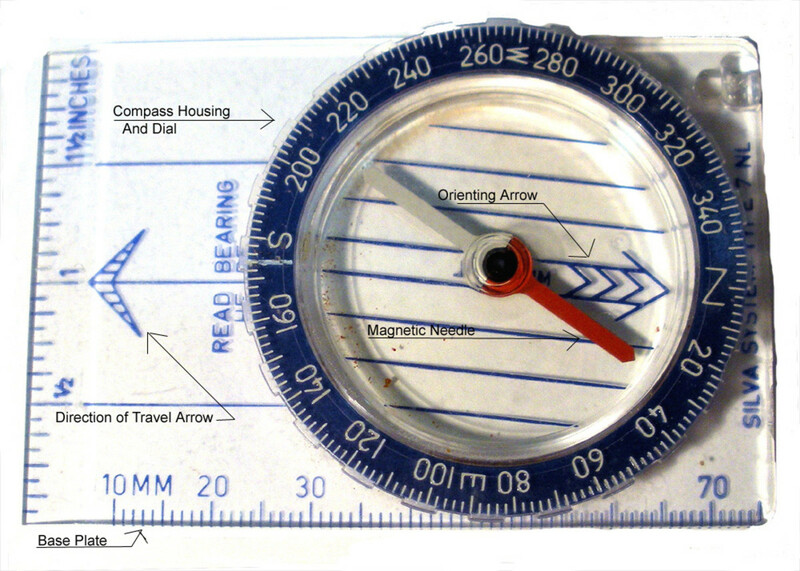 Compasses range from simple to complicated, depending on what you are planning to do. Sometimes, a very basic single direction is all you need, and a ‘general’ trek that way will be sufficient. 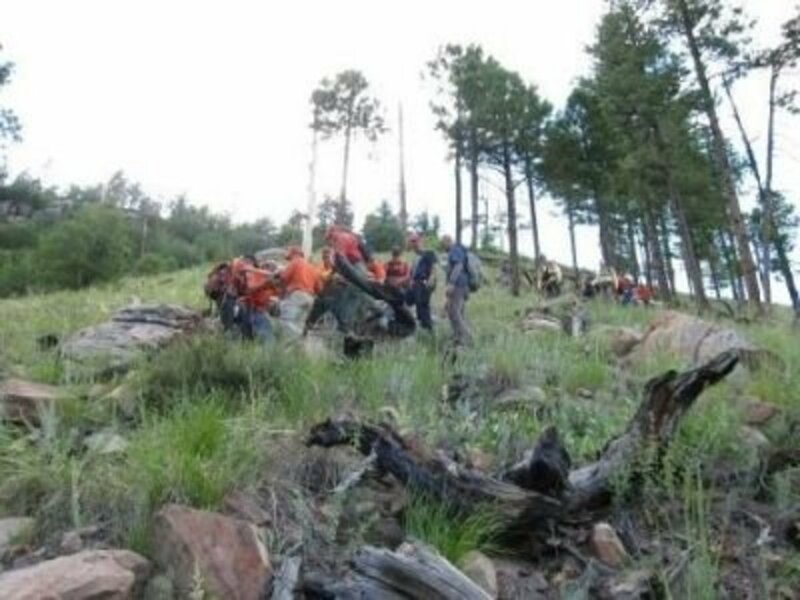 This was the case one time many, many years ago when I was hiking with a couple of other people, and all of a sudden, we noticed that the trail we’d been following had petered out, and we were in the middle of the woods! Oh, dear! What to do?? Well, we did have a compass with us, and arbitrarily chose to travel north, and kept on that path. Since we were not out in a backcountry wilderness, but in Muir Woods National Monument in Northern California, a park surrounded by urban areas, we knew that at some point we’d come out of the woods into something we either recognized, or could find help to get back to our car. Let me back up. We did not begin in Muir Woods. We started out hiking the Dipsea Trail from Mount Tamalpais, heading for its end at Stinson Beach. Either we made a wrong turn, or the trail markers were unclear or obscured. Whatever the cause, we ended up off the trail, and that’s how we ended up "lost" in the woods. It took over 3 hours of scrambling up and down miniature mountain ranges—gullies and hills--and some occasional scrambling up a tree to see if we could see any further and get our bearings: no such luck! 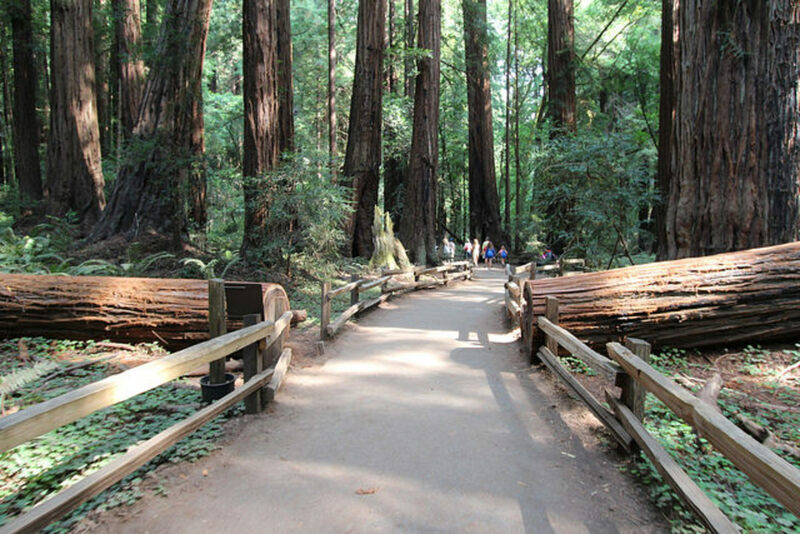 However, by following north persistently, we did eventually come out onto one of the trails within Muir Woods. Muir Woods Was Not Our Original Destination! Without that compass, however, our chances for coming out in the 3 hours would have been doubtful. We probably would have ended up walking in large circles, daylight would have faded, and we’d have been stuck there all night, become the subject of a newscast and objects of a search party the following day. This is a main cause of people getting lost. Part of the reason you end up going in circles is physical. Whichever ‘handed’ you are, your dominant-side leg probably takes a slightly longer stride. After some distance, the effect of this is to bring you back around toward your starting point. Disorientation is the other factor. In the middle of the woods, after a while, especially if you become fearful, and therefore stop thinking logically and calmly, every branch and twig and leaf and fallen log starts to look the same…or do they? Maybe they always look different. Maybe they are different. As the day wears on and the light fades, this effect is increased. This confusion can lead to panic. Panic leads to poor decision-making, which in turn can lead to disaster. With a compass in hand, however, you are walking with purpose: it is easy to stay on track and not go in circles. If you are surrounded by an urban area, as we were, you will eventually come out of the woods. If, however, you plan on going out into the wilderness, you had jolly well better have very advanced compass and map skills. Here is a photo of a basic compass, of a type which can also be used for some of the more advanced uses. Any compass will work, even a cheapie ‘toy’ variety. The difference is that the ‘cheapies’ are very simple, and the needle jiggles around a great deal, making it hard to settle down to get an accurate reading. The type shown in the first two photos is a liquid-filled type, and is much more stable. Let’s begin with naming the parts of the compass—this will make it all much easier to understand as we go along. If you refer to the photo above, you can see these parts illustrated. First, there is the base plate. This is the support for the compass, and also part of the tool for more advanced operations such as orienting oneself to a map. Printed on the base plate and pointing off the edge is the direction-of-travel arrow. Next, the most important part, the compass housing which contains the magnetic needle. Around the outer edge of the compass housing is the dial, which rotates to align oneself to the desired direction. Inside, printed on the bottom of the housing, is the orienting arrow. 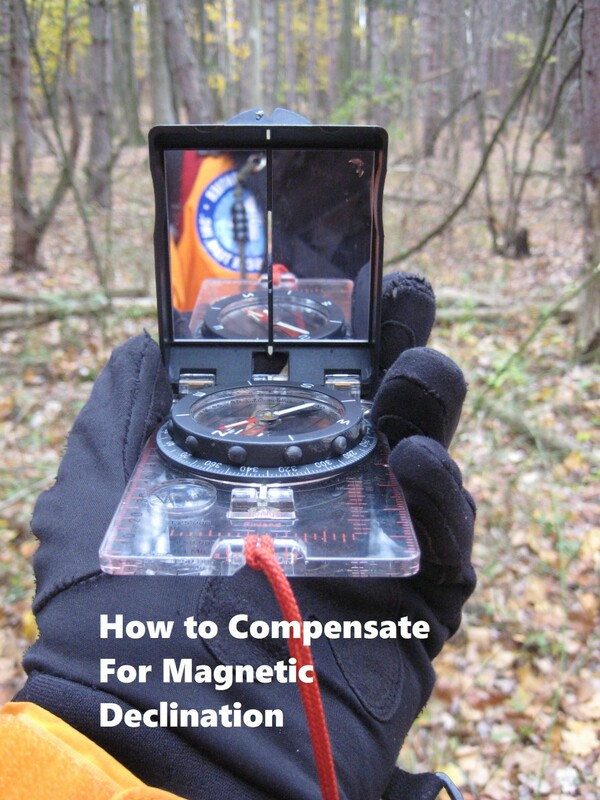 The magic is in the magnetic end of the compass needle. By tradition, it is always painted red. This red end is magnetized, and will always point to magnetic north, with one caveat: it can be fooled by nearby large metal (iron or steel) objects, such as cars or filing cabinets. But at a reasonable distance away from these things, it will swing true again. A common mistake many beginners make is to think that the magnetic needle must be lined up with the “north” indicator on the dial and the direction of travel arrow and the orienting arrow. This is not true, unless you actually want to travel to the north. What needs to happen instead, is to decide your direction of travel, and rotate the dial without turning the base plate in your hand, so that the compass point you've chosen lines up with the direction of travel arrow on the base plate. 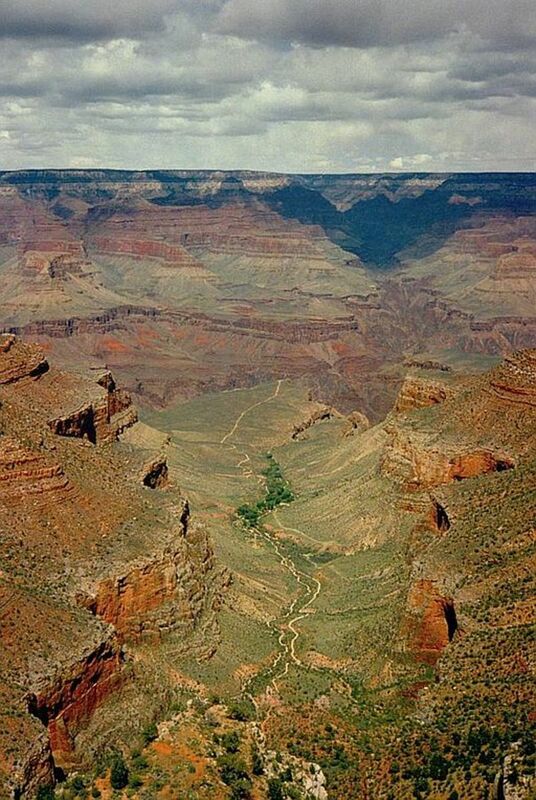 Note needle points north, not always your direction of travel. At this point, that red end of the needle will be pointing somewhere away from where you want to go, either right at you (indicating behind you) or off to one side or the other. This can be ignored. Simply keep holding the compass steady and in the same relative position to yourself, and you will be heading the way you wish to go. As long as you hold the compass pointing true to your forward direction, and maintain the orienting arrow under the red end of the magnetic needle, you will be on course. Here is a fun, short exercise to illustrate that point. It is called triangulation. Triangulation is very useful in many ways, one of which being how various seismograph stations determine the epicenter of any earthquake. Ready? Ok. Compass in hand. Pick any bearing at random between 0 and 120 degrees. Set your chosen heading on the direction of travel arrow, as explained above. 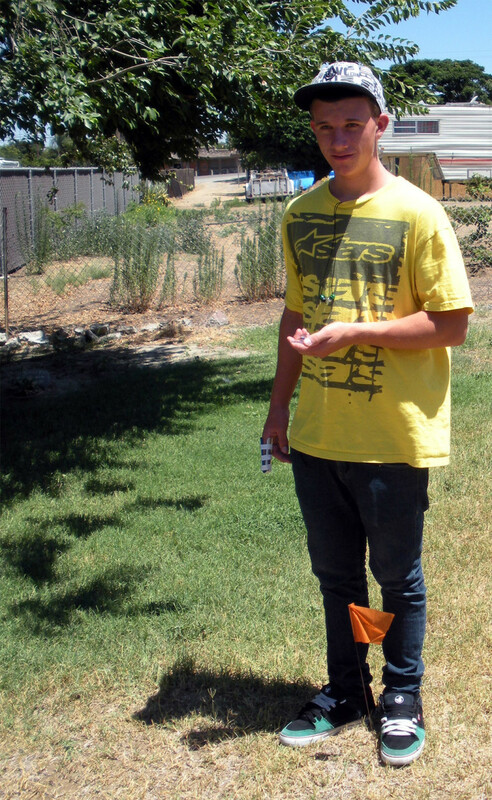 Drop some kind of marker between your feet. Now, pace off a pre-determined number of steps (let’s say 40 for purposes of illustration), and walk your chosen bearing for that number of steps. Stop. Add 120 to the number of your original bearing. Set the new heading and turn to face that direction. Walk the exact same number of paces as before. Stop. Again add 120 to the previous number (your second bearing). Set this new bearing, and walk again the same exact number of steps. Stop. Look down. If you did it right, you should find yourself within at least a shoe’s length of your starting marker. Done correctly, you should end up back at the starting marker. Note the start bearing my grandson chose was 52 degrees. You can see where this lines up with the direction of travel arrow. After walking his chosen number of steps, he stops, and re-sets a new bearing. 52 degrees + 120 degrees = new heading at 172 degrees. Final bearing points back at the start/finish marker. 2nd bearing of 172 degrees + 120 = 292 degrees final bearing. The compass I use, as pictured above, is a simple version with a base plate, which allows you to advance to more complicated usage. Not only is this elementary triangulation, it is the basis for an entire sport called orienteering. That gets into much more complex bearing determinations, necessary detours around obstacles, and advanced calculations to allow for the difference between true north and magnetic north. Yes, there is one: it’s called declination. That’s a whole other topic, far beyond the scope of this article on basic compass use. Yet another sporting use is the relatively new geo-caching, in which small containers are hidden in various places, and compass bearings and latitude/longitude references are provided for finding the container, or 'cache' (pronounced the same as 'cash' in referring to money). Inside the container will be, depending on its size, a piece of paper (log) to sign to show you were there, or a trinket to take, with a new trinket expected to be left in its place. Now get off the couch, grab a kid, and go outside and play! In closing, here is a useful little trick you can use to tell time if you don't have a wristwatch or any other time-keeping device with you. 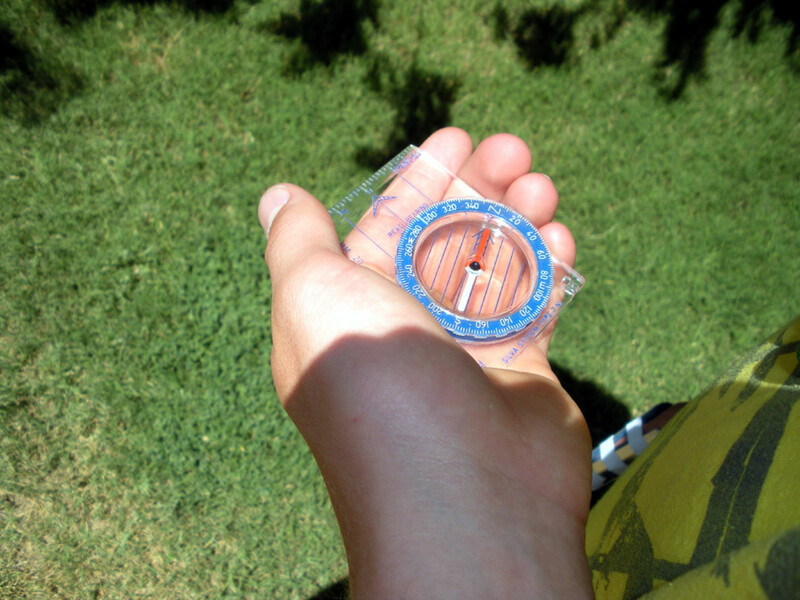 Once you know where north is, you can use your hands as a portable sundial. Obviously, this only works on sunny days, not rainy or overcast days. Stand facing north, hold your left hand, palm down, fingers curled under, and your forearm held parallel to your torso. Using your index or 'pointer' finger of your right hand, place the point of your finger against the center of the back of your left hand. Keep your index finger straight, and the others curled under out of the way. You want a good 90-degree angle between your finger and the back of your hand, and this is most easily done by raising your upper arm from the shoulder so your elbow is cocked upwards a bit, and your wrist bent down to make your finger touch the other hand. Now, imagine the back of your left hand as a clock face, and mentally place the numerals in their normal positions. Look where the shadow of your finger falls. Now you know the time. This gives an approximate hour; it will not account for minute-by-minute intervals, nor will it tell 'daylight saving time'--you need to make that adjustment yourself. No, not necessarily. 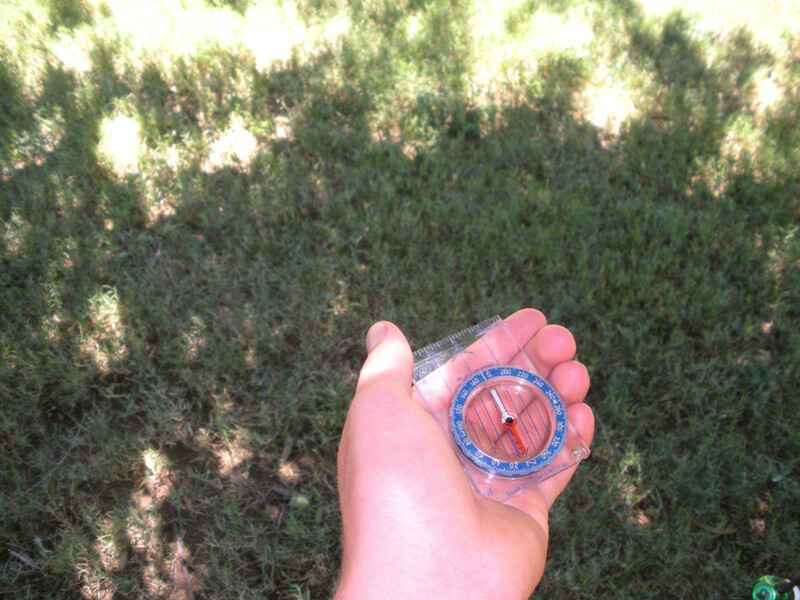 Using a compass requires paying attention to where you are going. You could go astray by not walking the same distance on each portion of your walk, or by making an error in calculations. The exercise I laid out in this article is only a very basic guideline, intended to teach people how compass points work. In the real world, it is very rare to use this actual model of triangulation. People go out and back mostly by the same route, or else make stops (waypoints) along the route. You might use this method if you wanted to return to your starting point by a different route, to view different scenery, for example. And, in the real world, you're likely to be calculating in miles, not steps. If you are traveling miles, there is another factor that comes into play, called "declination," and that is the difference between true north (the north pole), and magnetic north (which is what the compass reads. There are complex charts and calculations to deciper this. The farther away you are from the north pole, the more severe (or wider angle) the declination. 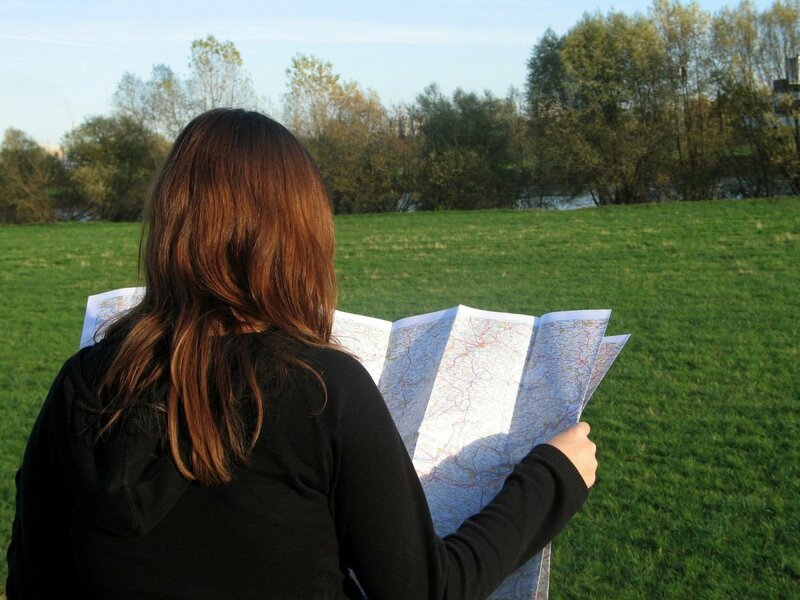 Depending on your exact location, you might be adding or subtracting degrees of travel, and if you don't, and just walk the straight magnetic compass point, you can be many miles off your destination marker, and be well and truly lost. So if I leave my front door an walk into the woods at 321° an lose track of time an paid no attention to where I was going,if I set compass to 101°, wouldn't that bring me back to where I started. loved it! I enjoy going out in the woods and bushwhacking. 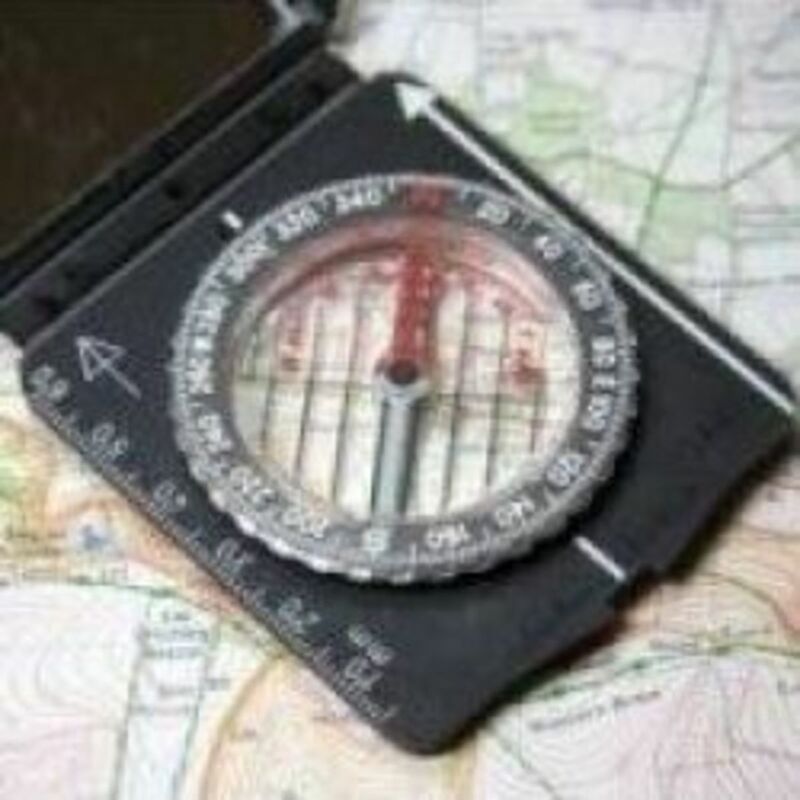 I've known how to use a compass since s child but I've learned a thing or two reading your hub. Thanks for sharing. 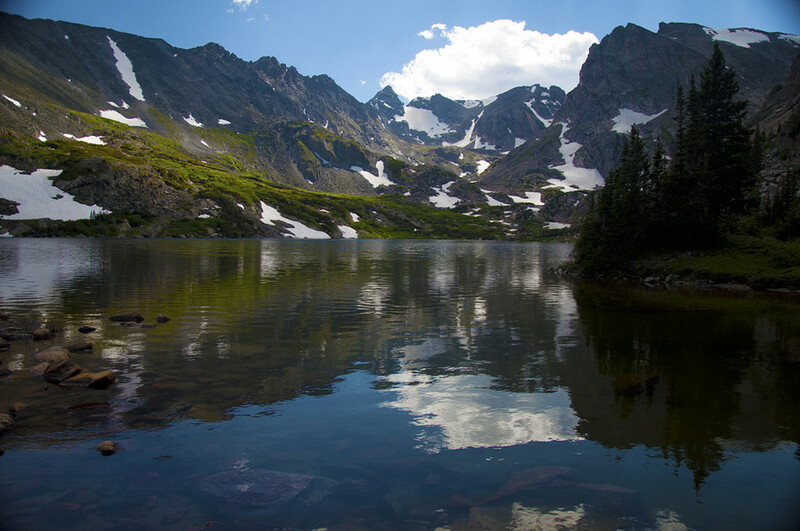 Hello, Aceblogs--thank you so much for stopping by. I'm pleased you and your mother found the article useful. Thanks for stopping by and your nice comment. You have a head start on East/West...we all do...just by knowing that the sun rises in the east and sets in the west, you can go from there to find North/South. The same holds true for moonrise/moonset, so you can still find your way at night. You'll get it, I know you will! So glad you have a hub on reading a compass. We were just talking about them on one of my hubs. I can't read them. My husband has tried to teach me one of these days I will get it but your hub has helped. I like the sundial too. Great hub. Heck, I don't even know where North, south,East and West are half the time. rs217000, thanks for stopping by! Glad you enjoyed the article. 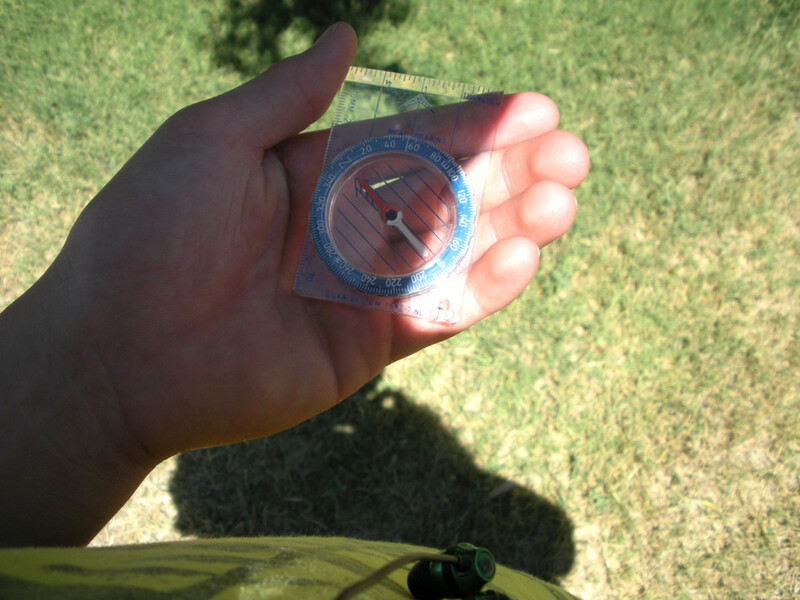 Fantastic - knowing how to use a compass is such an incredibly underrated skill. Excellent hub! My grandson can't either--I had to give him a crash course in even how to hold the thing to get the photos! Aarrggh! Great tips. I'm surprised how many young people can't read a compass! Pat--As you discovered in that situation, maps are usually printed with north generally at the top, or 'right-side-up' end of the map, with you at the bottom. Sometimes north will be on an angle away from straight up and down, but never pointing at the bottom of the map. Thanks so much for visiting my hub. Pat writes: I keep a compass in the pocket of my Gortex raincoat. I wear this coat on hikes, and when I travel by train ( not in summer) because it is truly waterproof. Last winter I took the train up to a city in the north of England to meet Wonderful Husband who was working there. I had a map of how to get to the hotel, but when I got off the train I could not work out which way was 'up' on the map. Then I remembered the compass in my pocket - it saved me loads of time.